You know about planets and the asteroid belt. Those are all found in the center of the Solar System. Beyond Pluto is the Kuiper Belt that circles the Solar System. Guess what? There's more to our system beyond the Kuiper Belt. The Oort Cloud is a huge spherical region that surrounds the entire system. It holds millions of small pieces of ice and rock that slowly orbit the Sun. When you visualize the orbits of planets, you usually think of a disk around the Sun. The Oort Cloud is different in that it has a spherical shape. Scientists believe that its shape is created by the gravity of the Sun. Objects in the Oort Cloud are not found beyond the pull of the Sun's gravity. Beyond the Oort Cloud are the termination shock and heliopause. While the inner solar system is protected from many external forces, the Oort Cloud occasionally encounters large forces that affect the orbits of the icy bodies. A force called a molecular cloud (made of hydrogen) might move through our galaxy and collide with the Oort Cloud. This interaction has the force to send comets in many new directions. What do you find in the Oort Cloud? We have already discussed the large icy objects that circle the Sun. The objects are different because many have different origins. Astronomers believe that the icy bodies come from different places in our Solar System. They may have started in a region close to the Sun when the Earth was forming. Some may have always been beyond Pluto and slowly migrated to the extreme edges of the Solar System. The Oort Cloud has almost all icy bodies while the Kuiper Belt also has many asteroid-like objects and small planetoids. Astronomers believe that some of the icy objects in the Oort cloud are knocked out of distant orbit when other stars pass by ours. The gravity of other stars causes the icy balls to move in a new direction and they can develop into long-period comets. Not all of the objects move towards the inner system. 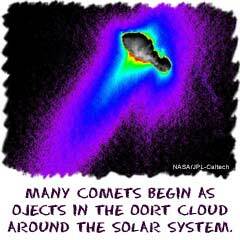 Some of the comets and objects can be pulled out of the Oort Cloud into interstellar space.